Posted on October 4, 2018 at 4:29 pm. Fein thumbnails the impeachment process, and we talk about past cases of impeachment of Bill Clinton, Richard Nixon and Andrew Johnson. 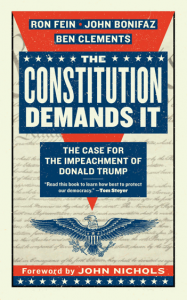 Then he details the 8-plus draft articles of impeachment proposed in the book. We agree on 7 of the 8 charges, and briefly discuss the Russiagate narrative. Posted on September 26, 2018 at 7:02 pm. Posted on September 25, 2018 at 10:00 am. Posted on September 21, 2018 at 8:22 pm. Free Speech For People Legal Director Ron Fein was recently joined by NBC Think to discuss the call on Congress to begin an impeachment investigation of President Trump. Posted on September 21, 2018 at 8:17 pm. In a recent article in The Nation, John Nichols cited our campaign calling on Congress to launch impeachment proceedings against Judge Brett Kavanaugh for committing perjury. Kavanaugh actively hid his own involvement, lying to the Senate Judiciary Committee by stating unequivocally that he not only knew nothing of the episode, but also never even received any stolen material. The Framers of the US Constitution understood that corruption in the process of obtaining a federal office is an impeachable offense… Judge Kavanaugh’s perjury in the process of obtaining his current position on the US Court of Appeals for the DC Circuit, should…lead to his removal from the federal judiciary and should disqualify him from ever holding a future federal office. There is precedent for impeaching judges who have committed constitutional violations and perjury, and there is sufficient evidence that shows Kavanaugh lied under oath. The solution is to launch impeachment proceedings against Judge Brett Kavanaugh. Sign our petition now to encourage Congress to act! Posted on September 21, 2018 at 8:10 pm. On September 13, 2018, Free Speech For People Legal Director Ron Fein presented at the Congressional Black Caucus Foundation’s Annual Legislative Conference. The special forum, “Impeachment: A Necessary Remedy for Bigotry in Policy,” featured honorary host, Congressman Al Green, Ron, and Distinguished Professor of History at American University, Allan Lichtman. To hear Ron’s remarks, watch the Facebook Live video below. To watch this video on Facebook, click here.